Pak Terrorists kill 35 in Jamrud injuring 6o others by remote-controlled IED blast. Both sides (the attackers & the victims) shouted Allah-ho-Akbar. Blast kills 35 in Jumrad (Khyber agency) injuring 6o others. PESHAWAR || Tuesday 10th January 2012 || Safar 15, 1433: A remote-controlled bomb blast killed 35 people and wounded more than 60 others on Tuesday in a tribal region of northwest Pakistan Tuesday in the deadliest such attack in months, officials said. The explosion took place in a market in Jamrud, one of the towns of the troubled Khyber tribal region, which also used to serve as the main supply route for Nato forces operating in Afghanistan. “The total number of deaths in the blast is 35 while 69 people were wounded, and of them the condition of 11 is critical,” a senior administration official, Shakeel Khan Umarzai, told AFP. Another top official in Khyber, Mutahir Zeb, said the target of the attack was not immediately clear. “According to initial information, it was a remote controlled device planted in a passenger pickup van,” he said. There were about 120 bomb attacks in Pakistan in 2011 and the same number in 2010 according to an AFP tally – an increase from 2009, but far below the violence of 2009 when there were more than 200 bomb blasts. The frequency of high-profile bombings has decreased in Pakistan over the past year. This is the bloodiest attack since a suicide bomber killed at least 40 people at a mosque, also in Jamrud, in August last. 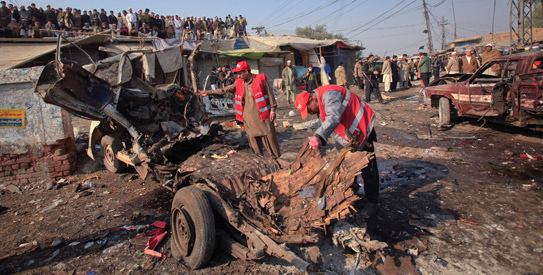 Jamrud has been the target of several major blasts in recent years. No group has said it carried out this latest attack as yet. The BBC’s M Ilyas Khan in Islamabad says the Jamrud area is dominated by the Kukikhel branch of the Afridi tribe, who have organised a militia to fight a local faction of the Taliban. Several militant groups fighting the government are active in Khyber region, which is close to the Afghan border. Although the target of this attack has not been confirmed, one report suggests members of the anti-Taliban militia were in the vicinity when the blast took place. Pakistan is a key US ally in the fight against militancy in the region and its army has carried out several offensives against militants in their tribal strongholds. Correspondents say there has been recent media speculation about peace talks between elements of the Taliban and the Pakistani government. But militants denied such talks, saying they would take revenge if the army continued to carry out attacks against them. On Monday, at least 10 paramilitary troops, who had been abducted late last year, were found shot dead in neighbouring Orakzai tribal region. Courtesy & Input : Dawn | BBC | Reuters | AFP | Agencies. Alertpak……..just to alert about pakistani terrorism. The Boiling points of Kashmir and the Mohajir Movement in Pakistan. Heinous Talibans assassinated a senior journalist in Pakistan. Again Shiite Muslims are gunned down by Sunni Muslim Terrorists in Pakistan. 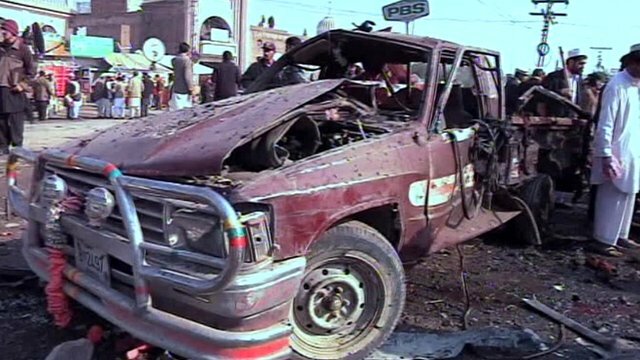 Four policemen killed and Fifteen others injured in bomb attack on police convoy in Torghar district, Pakistan. Gunmen attack bus carrying Shia pilgrims in Pakistan’s Balochistan province. 26 killed shoot out in two rows. Jihadi attacks successfully took away 13 Muslims injuring 40 at Karachi & Peshawar in Pakistan. Twenty One killed in a Check Post attack and firing on a Passenger Bus by Militants in Pakistan. Ten militants killed in encounter. Many killed in deadly Jihadi Blast at Quetta, Pakistan. Top Al Qaeda suspect arrested in Pakistan. Welcome Visitors ! Thank You !! Khuda Hafeez !! !